Manchester United striker Romelu Lukaku won himself a few more fans at Old Trafford with his celebration for Marcus Rashford’s penalty tonight. The England forward stepped up to score a memorable winner for the Red Devils as they won 3-1 away to Paris Saint-Germain, going through to the Champions League quarter-finals on away goals. Lukaku watched on as Rashford took his crucial spot-kick late on, and immediately celebrated wildly in front of former Man Utd star Angel Di Maria. 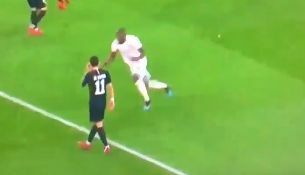 The Argentine lapped it up a few weeks ago when PSG won 2-0 at Old Trafford, so no wonder some fans are enjoying this moment from Lukaku to rub it in to their former player! Lukaku is already a club legend for celebrating in front of Di Maria ?? ?